The Chibi Lark model for small electrical reels to catch medium and small fish with a neat design is equipped with the Chibi Smart Support without protrusions and smart rod holder part on the body. Incorporating a dry bag with storage pocket as a standard accessory. A long version of Chibi Lark Type S with a mounting width of 160 mm. 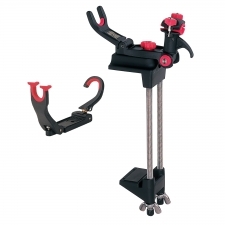 The smallest and lightest Lark Rod Holder Series, provided with a spare rod holder, plays dual roles. Either one of the two types of rod holding components can be selected and replaced with ease with a screw according to the target fish and fishing method. Packed with basic features, such as a quick bolt with fast mounting onto the boat side as well as vertical and horizontal attachment, swing, and handle ring functions. 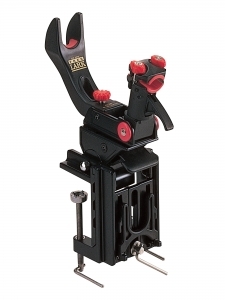 A super-wide version of the Chibi Lark, the smallest and lightest Lark Rod Holder Series, provided with a spare rod holder, plays dual roles with the mounting width increased to 16 mm. Ensuring excellent stability to withstand left and right twists because the boat side is gripped with the upper and lower non-slip rubber components. 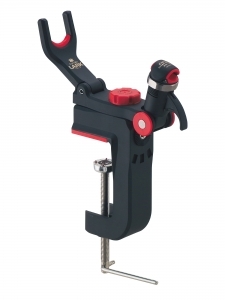 A super-wide version of the Chibi Lark, the smallest and lightest Lark Rod Holder Series, provided with a spare rod holder, plays dual roles with the mounting width increased to 225 mm. Ideal for boat fishing in Kyushu, Okinawa, and the Sea of Japan. 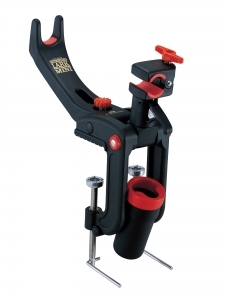 A Mini Lark rod holder model for medium and small fish provided with various advanced features. 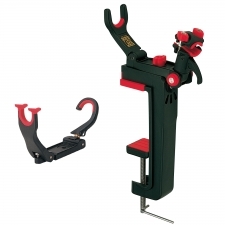 A Lark model of evolution type incorporating the Mini Smart Support as a standard accessory and available in three-stage changeable arm positions. Achieved a 30% lighter weight in comparison with the conventional product (Mini Support). Two types of smart heads are provided (i.e., 7 to 21 mm dia. and 15 to 25 mm dia. ), either one of which can be replaced according to the rod diameter. 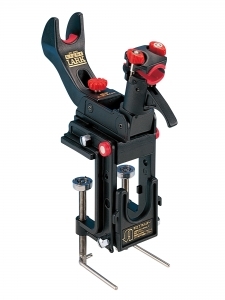 Provided with line hooks and non-slip rubber as well as an angle adjuster and the Mini Smart Support with unevenness reduced as much as possible for the elimination of line entanglement. Provided with a large washer that can be secured to the boat side firmly and a removable scratch-resistant non-slip rubber cover. A rod holder that can withstand a pulling load of 90 kg dedicated to medium and small fish. Available for a variety of reels, ranging from spinning reels to compact electric reels, and mounted to the boat side or other objects, such as handrail pipes. A pocket size that can be accommodated into a rod case as well when carried. Only the rod swings left and right and jerks back and forth, and can be detached with just a single action with fingertips. The rod holder and support use carbon-reinforced resin provided with left and right line hooks. 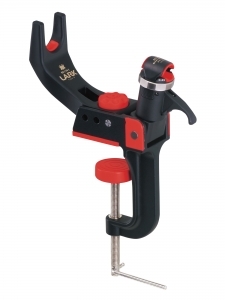 A lightweight, compact Mini Lark model added with the functions of the Super Lark. 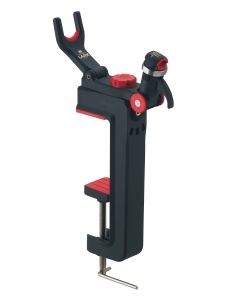 A boat-dedicated rod holder with enhanced operability supported by a variety of functions, including a 180°, five-stage wing function, handheld helper function, rod stand holder function and vertical and horizontal mounting function. A lightweight, compact handheld design (1.1 kg) when folded. A handy rod holder that tolerates a load of 130 kg and respond to anglers’ needs. 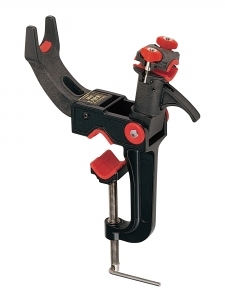 The clamp is mounted securely with two stainless steel screws. 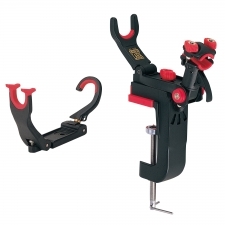 The clamp and body are made of rust-resistant AD light alloy. Possible to set the product to quick fall style, normal style, or easy fishing style with just a single lever action. An excellent product changes freely. A rod holder that responds quickly to anglers’ request with just a single lever action. An ultra-versatile version that combine the functions of the conventional Lark Rolling Series into this specific product. Vertically or horizontally mounted as desired. The rod holder swings left and right (180°, seven stages) according to the tide flow, thus making it possible to fix the rod at the desired angle. Possible to respond flexibly in the direction to avoid entanglement in a narrow place. The rod can be kept at the height of the waist, which halves the user’s fatigue and ensures ease of jerking by raising the rod holder to the front. Possible to respond quickly to hooking and feeding the line. Convenient when moving to a different point. Just pull out the holder part and hang the Shirite Rope on the hook. The holder part incorporates a powerful magnet. Possible to adsorb hooks and scissors. Speeding up the installation/removal of the Mini One-touch Support.